Going up the pedestrian Dionysiou Areopagitou Street and on and past the theatre of Dionysus and other important monuments, one comes to the Odeon of Herodes Atticus, also known as the Herodeion. It was Built in about AD 160. 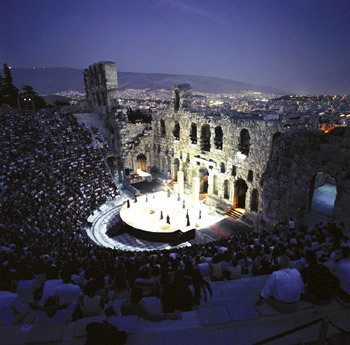 Today the Odeon functions as a theatre and in the summer months it hosts concerts and performances of ancient drama, lyric theatre and dance as part of the Athens Festival.